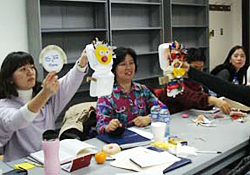 After three days learning from and exchanging ideas with the College of Education's University Primary School, 18 visitors from Korea's Keimyung University took away new, inspiring ideas to use in their own classrooms. "My heart is so full with new ideas for my preschoolers," commented one visitor. "The ideas are like balloons that lift me up so I can fly with new possibilities!" Professor Jin-Hee Lee, a former Ph. D. student in the University of Illinois' College of Education's Early Childhood Education program, organized a group of graduate students from Keimyung University to come to University Primary for a study tour. Most of the students were also preschool directors or teachers, some at gifted early childhood programs like University Primary School. "We always have visitors, but this was really an exchange," said Nancy Hertzog, Director of University Primary School. "We wanted to exchange ideas with them, and they really wanted to learn about what we were doing. The faculty has expertise here, and it's great that we can bring people here to share that." Hertzog and the teaching staff at UPS shared different themes and approaches to learning taken at University Primary School - challenge, choice, creativity and project work. Then, in the tradition of the school, Hertzog had the visitors make project presentation boards showcasing what they learned. "It's a way of engaging them and focusing them in on what they're learning," Hertzog said. "This project approach can be implemented in so many different ways, so what they appreciated here was that they had more freedom to implement it the way that it would suit their students." Daniel Walsh, Associate Professor of Curriculum and Instruction, and formerly Lee's adviser, echoed this sentiment of engagement between the Keimyung University visitors and College of Education faculty. "The study tour presented invaluable learning opportunities," Walsh said. "It challenged them to think about why and how they were doing what they were doing, to share their ideas about early childhood education and teaching practices, and to explore similarities and differences in early schooling between two countries." Lee said she was grateful for the opportunity to bring her students to a program with such a highly regarded reputation, and the chance to return to her alma mater. "As I approached the Illini Union, the strikingly familiar landscape, albeit with a couple of new buildings, filled me with memories of good people and important moments in my life. Learning from a taxi driver that the state of Illinois and the U of I are experiencing economic difficulties had me quite worried," Lee said. "Seeing the hardworking, dedicated faculty as well as the energetic and intellectual students in the College of Education made me feel proud of them, and of my education." She added, "The College of Education at Illinois has great international influence. I am confident it will continue to contribute to improving schooling for our children, both nationally and internationally."